Craving a juicy burger? Treat yourself to a delicious version of this American classic at one of the best restaurants in the Ocean State. Rhode Island is serving up everything from all-beef gourmet burgers to burgers piled high with crispy bacon. Some spots even offer mac and cheeseburgers (yes, those exist) or healthier vegetarian options. Take your pick at the 10 best burger joints in the state. Everyone loves Harry’s, including former President Barack Obama, who has stopped by himself to try a delicious slider. You may want to order the same thing, as their burgers are made with 100 percent pure Hereford beef whether you are on Main Street or up on their Federal Hill location. Blackie’s almost always has a wait—but it’s well worth it. Build your own burger, or go with one of the tavern’s own creations, which include the brisket burger melt: A beef patty coupled with a 14-hour smoked beef brisket. This BYOB place serves up consistently great burgers and drinks within a funky beach atmosphere! The Luna Sea Burger is a salmon burger wrapped and baked in phyllo dough, a healthy alternative to their other juicy options such as the Fireworks Burger. Make sure to couple your entrée with some crispy and delicious sweet potato fries! This classic train car-turned-1950s diner is best known by locals for its delicious breakfast food—but it also serves up some of the best burgers in East Greenwich with service that can’t be beat! A tip: The portions are generous, so don’t be afraid to split or share. Take a look at the neon retro sign outside of Stanley’s and you’ll immediately know that you’ve found just the right spot for a classic burger. 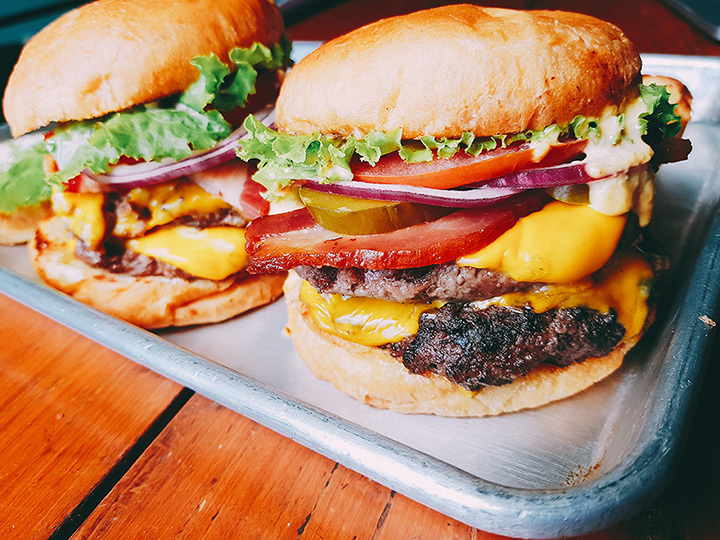 Try a double bacon cheeseburger, stacked with juicy strips of bacon and deliciously melting cheese. The Quebec-style fries aren’t to be missed, either! Located in the Jewelry District, Jr’s can be found in a sort of unassuming location you may have passed by once before. Great for dinner or a late-night snack, Jr’s offers up tasty choices like the triple pepper burger (served with their classic fire sauce) or the Alpine and Southwest Jr’s. Call ahead for a reservation because Brick Alley is constantly buzzing! The Pub has great options for gluten-free, dairy-free, and egg-free eaters, as well as numerous choices for more traditional feasters. Burgers are sourced locally, and come straight from a Newport butcher who makes sure to provide quality meat for every piece of these 10-ounce patties. You’ve never seen burgers as stacked as Feast’s! Try the Buffalo chicken burger, which is full of leafy greens and a delicious special sauce, or the La Jolla, which is topped with a delicious fried egg. Ever tried a mac and cheeseburger? Though we admit that it’s usually unwise to eat a sandwich any bigger than the size of your head, this is one that you won’t regret. Luxe offers burger lovers the chance to craft their own deluxe burgers, and the options are endless. Start with the base—options include chicken breast, ahi tuna steak, or lean bison in addition to regular beef—and pile it up with cheese or any amazing selections like mac and cheese, smoked bacon, or even bacon jam. Don’t know what that is? You’ll have to try to figure out.